This year’s High-End CES seemed even more poorly attended by civilians than last year’s CES, which is saying something. It’s pretty plain that when the CEA switched from the traditional weekend shows to the current weekday ones they threw the switch on consumer attendance. (There is talk about returning to the weekend show next year.) On top of this, the specter of Everybody’s Favorite Audio Show, Munich High End, now looms even more ominously over the Las Vegas festivities. To be honest, if I were a high-end manufacturer and I had to choose between these two expensive venues, I’d be heading for spargel and weisbier country. Nonetheless, as of 2015, every manufacturer and his brother were still coming to Vegas, like flocks of birds pulled by ancient, in-bred, migratory impulses. Lots of new stuff was shown (as you will see), and for once the sound was uniformly good. For me, there were next to none of those stopped-in-my-tracks moments when I said to myself, “I gotta review this!” Nonetheless, good sound is better than bad, which is the way CES usually sounds. So I count this year as a rare success in the annals of CESes. As usual, I forewarn readers and manufacturers about mistakes in pricing, nomenclature, and associated equipment. Though I had our newest editor/contributor, Ms. Mullins, in tow (in large part because she hears better than I do), we’re still just two people with satchels full of blues (and rock, and classical—and alt.punk in Ms. Mullins’ case). Mistakes will be made, and rooms and companies not visited. Our apologies in advance for any errors or omissions. Although they haven’t shown all that well in the past, Focal’s flagship $197k Grande Utopia EM four-way, five-driver, quasi-D’Appolito floorstanders with articulating tweeter, midrange, and midbass modules, and electro-magnetic woofers, have done a one-eighty at recent shows, and were once again exceptional at this year’s CES. Driven by Naim’s $249k NAC S1/NAP S1 Statement electronics (preamp/monoblock amps) and sourced by an NDS streamer, the Grande Utopias sounded warm, full, beautiful, and detailed on every cut I listened to. Generally I’m not a fan of beryllium tweeters, but Focal’s inverted-dome iteration is the exception—so much more delicate and less edgy and aggressive than the other beryllium tweeters out there. I was also impressed by Naim’s gorgeous tower-shaped amps and preamp, which exercised superb grip on loudspeakers that, because of their size and complexity, are not always easy to drive. While the Naim gear may have been adding just the slightest solid-state dryness and granularity to the presentation, it still mixed wonderfully well with the Focal’s inherent beauty, producing a lively and delicious sound, like a salty margarita. 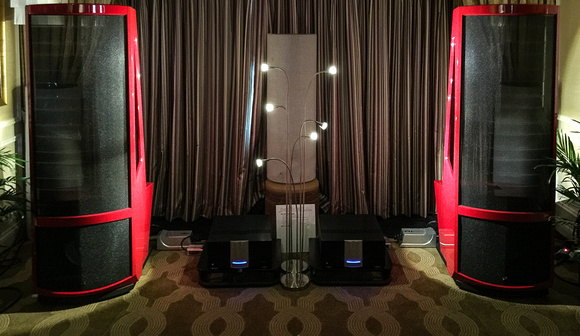 Verity’s high-sensitivity, four-way, four-driver, $120k Lohengrin IISes were being driven by Lamm Industries’ $139k SET ML3s in the bass and Lamm’s $37k SET ML 2.2s in the midrange and on top. 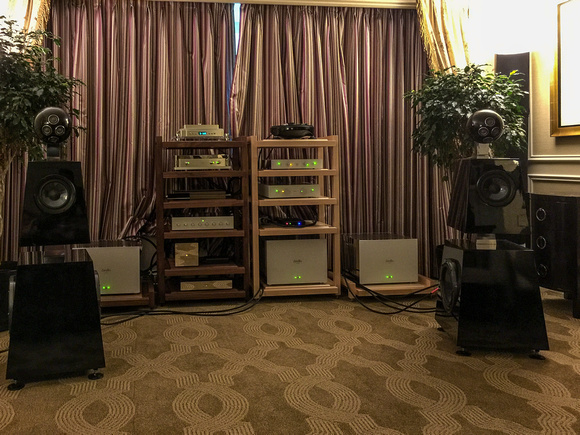 The sound was drop-dead gorgeous—in its own way as natural and enjoyable as the Focal Grande Utopias were with the Naim gear, but with all the SET tube virtues instead of the solid-state ones. Since the Lohengrin IIS is not a speaker I’ve cottoned to in the past, I have to assume that Vladimir Lamm’s electronics were making the lovely musical difference. The combo was superb on Leonard Cohen’s “Ain't No Cure For Love,” from Lennie’s own terminal-smoker’s croak to the angelic background vocals of Sharon Robinson and Charley and Hattie Webb to those thrilling Hammond B3 exclamation points to Dino Soldo’s throaty, lilting sax. And the system was just as impressive on the Feria from Ravel’s Rapsodie espagnol, albeit with a little less resolution of the inner voices of string choirs than the Naim solid-state amp delivered in the Focal room. Though this was probably not the ultimate alt.punk amp/speaker combo, for acoustic music of any scale it was outstanding. And, oh, that SET tone color! YG Acoustics’ brand-new, $24,300, two-way, aluminum-bodied Carmel II, driven by D’Agostino Momentum electronics, and sourced by dCS digital and Kronos Sparta analog made a killer-good first impression. Sweet, open, and lively at low levels on the Debussy Violin Sonata, the Carmel was just as impressive on the more rocking “Ain't No Cure for Love.” It was odd how warm and lovely D’Agostino Momentum electronics sounded here, compared to elsewhere at CES. My conclusion was that they must be super-transparent to sources and loudspeaker loads—how else explain their chameleon-like character? In any event, the presentation in the Carmel/D’Agostino room was excellent, allowing for any two-way’s minor dynamic-range limitations. Timbres, both instrumental and vocal, were both beautiful and realistic on Rickie Lee Jones’ “Danny’s All-Star Joint,” with real bite on brass, and very good bass (for a two-way), with excellent reproduction of the chucking bass line and good impact and speed on drumkit. The new Carmel appears to be a great two-way loudspeaker, with rich dark timbre and buttery-smooth treble. As was the case with Lamm Industries, YG Acoustics had the best show of its relatively young life, performing equally well in a second room, where its $73,800, five-driver, four-way, quasi-D’Appolito Sonja 1.2 floorstander was paired with Boulder’s 2120 DAC ($55,000–$60,000), 2110 preamp ($55,000) and 2160 stereo amp ($53,000). As was the case with the Carmel II, the sound was as rich and sweet as couverture chocolate. Rather amazingly, Boulder actually had the Bartók quartets on its server, and I listened to the entire Second Quartet, simply because I couldn't tear myself away. The Sonja/Boulder combo supplied superb articulation, gorgeous timbre, and that same buttery treble throughout, yet with no lack of texture or bite on this fabulous piece of music, even during the most intense contrapuntal passages in the second movement Allegro. 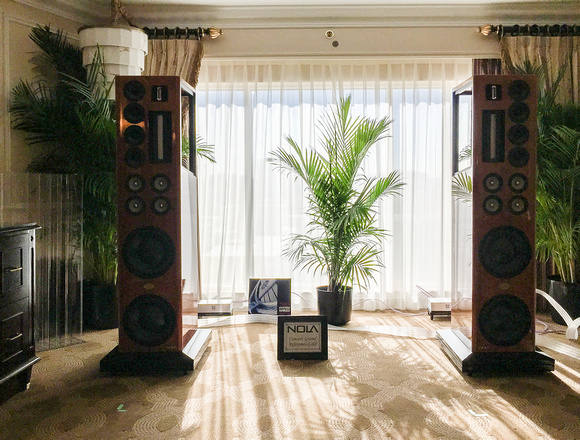 These were really wonderful loudspeakers and electronics, featuring what was perhaps the most analog-like DAC (the Boulder 2120) I’ve heard at a trade show. 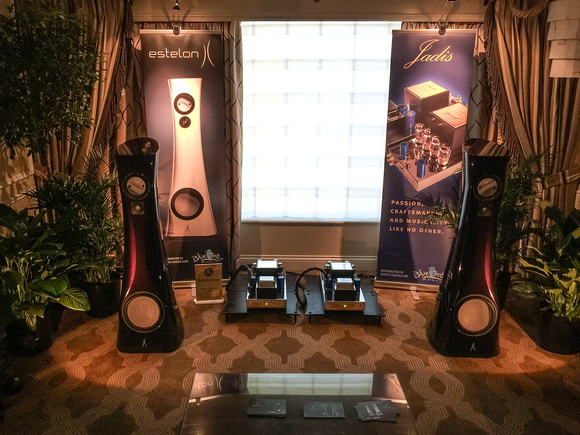 Estelon came very close to making it into the Top Five systems with its $45,900, three-way, three-Accuton-driver XA floorstander driven by Jadis’ $11,900 PRE 1 and its $26,900 JA 120 monoblock amplifiers, and sourced by a $13k Chord Electronics DSX 1000 DSD Network Music Player. With Estelon’s ultra-neutral, ultra-fast, ultra-high-resolution drivers (including its exceptionally well-integrated ceramic tweeter) paired to ultra-sweet Jadis gear, the sound was quite lovely and natural. Even digital sounded special through these great transducers. In addition to the Estelon XA, several other speakers very nearly made it into the Golden Circle. 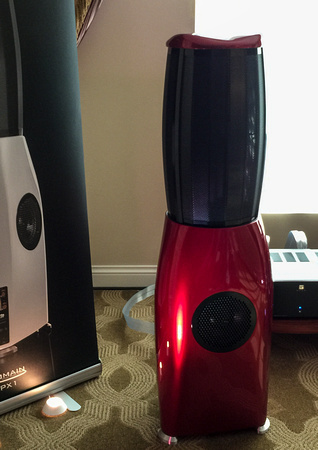 The first was MartinLogan’s $80k Neolith hybrid electrostatic. Essentially a CLX with a passive 12" midbass and powered 15" sub, the Neolith sounded of a piece, with none of the discontinuity or heaviness in the bass that ML hybrids have so often exhibited in the past. Powered by Krell Class A monoblocks and sourced by a Berkeley Reference DAC, the Neolith was thrillingly realistic on piano and voice, with that grainless, airy, bell-like treble that only ’stats and ribbons seem to have in fullest abundance. Simply put: the best MartinLogan hybrid I've heard. The second strong contender for the laurels was Muraudio’s Domain PX1 passive omnidirectional electrostatic loudspeaker, driven by Simaudio electronics. An ingenious loudspeaker and a superb-sounding one, to boot, the Domain PX1 pairs a 360-degree array of “continuously curved” electrostatic panels with three 9" aluminum woofers distributed around the circumference of a sealed, cast-aluminum enclosure. The sound was just wonderful on full orchestra—light, airy, open, full-range, with a gossamer-like delicacy that reminded me of one of my favorite loudspeakers of the distant past, the Acoustat X. A third top contender was the $197k Nola Concert Grand Reference Gold multiway ribbon/cone hybrid, driven by ARC’s Reference 75 monoblock amps, Reference 10 linestage, and Reference CD 9 DAC. Boasting an extremely good blend of disparate drivers, kickass bottom end, and superb transients, it sounded very open, very full-range, very high-energy, and very neutral to my ear. The Sheffield Drum Record (talk about chestnuts!) has seldom, if ever, sounded better than it sounded here. Ditto for the gypsy guitar, footstomping, and voices on that hoary old Spanish Flamenco LP that my friend Ray Andrews used to play all the time. Double-ditto for Hugh Maskela’s “Coal Train.” Yeah, ARC electronics aren’t quite as fast as solid-state, and there may be a little bit of softening or restraint on the hardest transients. But fair is fair. This was one of the truly outstanding rooms, and Nola loudspeakers are right up there with the best, despite what you may have read elsewhere. A fourth top contender came from a Japanese company I’d never heard of before, Diasoul Corporation, which introduced a fascinating, high-tech, three-way, seven-driver loudspeaker, the $85k Diasoul i, with an array of four, unique, Mitsubishi-developed-and-manufactured, boron-carbide tweeters (after diamond, which has its own issues with mass, boron-carbide has the highest propagation speed and lowest internal losses of any diaphragm material) mounted on a spherical head unit for even power response and better ambience generation and retrieval. In addition to its unique boron-carbide tweeters, the Diasoul uses the very latest NCV (nanotube carbon), said to be capable of very-high-velocity propagation with no internal loss, for its midrange and woofer drivers. Though the Diasoul i looked a little Star Wars (in a pleasing way), all I can tell you is that this ultra-high-tech, vaguely robotic contraption of rare-metal parts sounded superb on female voice and piano—and this was 44/16 digital (using Zanden’s great Model 2000 CD player, as well as the $19,990 Model 8120 stereo amplifier and the $12,500 Model 3100 linestage preamplifier that won several of this year’s TAS Product of the Year Awards)! Equally superb on Leonard Cohen on vinyl, the Diasoul i was certainly the coolest thing I saw at this year’s CES. So damn sweet and so realistically “there” on the music I listened to, it will certainly win my Technology Breakthrough Award, as well as being a strong contender for Best of Show. Hats (or space helmets) off, gentlemen! We may have a new player/alien in our midst. 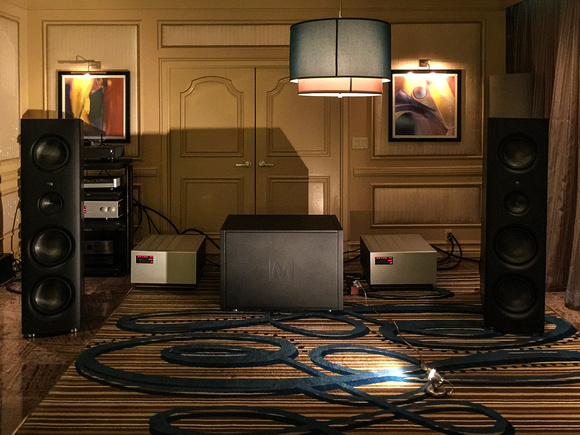 My fifth contender came from a more expected source—Rockport Technologies, which showed its $33k, four-driver, three-way Avior floorstander with Absolare’s new $40k Passion 845 85W push-pull amp and $32.5k Passion Signature preamplifier. The sound was reminiscent of Vladimir Lamm’s rooms—perhaps a bit less dynamic but extremely rich, spacious, detailed, and beautiful. The Aviors are virtual reincarnations (for a lot less money) of Raidho D-5s, in that their presence and brilliance range are a little recessed but their power range is very strong and dense in color, with a midbass that is solid and driving (though their deep bass is somewhat missing in action). The Avior/Absolare combo was great on Rickie Lee’s vocals from ”Danny's All Star Joint.” In fact it was splendid on the entire ensemble, and everything else I heard. Minus the low bass, this was an extremely natural system, and a BOS candidate. My sixth top contender also comes from an old marque. In addition to its flabbergasting turn in the Lamm room, the $52k, four-driver, three-way Wilson Audio Alexia was being shown in several other spots, most notably in the Soulution room, where it was driven by Soulution’s Product of the Year Award-winning 711 stereo amplifier and 725 preamplifier, and sourced by a Soulution 560 DAC. All gear was mounted on Critical Mass stands. Alexias haven’t been my favorite speakers in the past, but after this show…well, let’s just say my opinion has changed. Along with the Lamm room, the Soulution room made the best sound I’ve ever heard from these Wilsons—terrific tone color, transient response, and bass definition. Terrific, overall. My seventh top contender came via Hansen Audio, which debuted its $60k three-way Dragon Legend E floorstander, paired with $15,700 E.A.R. 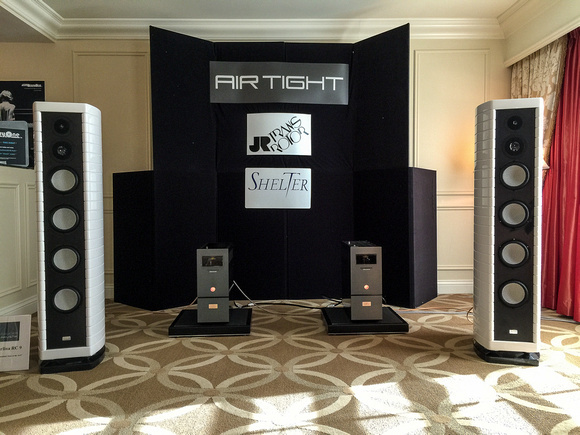 509 monoblock amplifiers and a $13k E.A.R. 912 full-function preamp. It was an impressive opening night. On the Rachmaninoff Symphonic Dances the Dragon Legend E’s sounded pretty damn spectacular—very hard-hitting (on what, in Chad Kassem’s reissue of the Turnabout LP, is one of the hardest-hitting orchestral recordings I own), while also beautiful and natural in timbre, with particularly good wind tone on the often piercing flutes and piccolos in the first movement. On whatever I played, the Hansen demonstrated a very nice ability to maintain strong tone in spite of dramatic changes in dynamic levels and loudness. Indeed, were it not for the fabulous Focal, Lamm, and YG Acoustics rooms, the Dragon Legend E would certainly have been a finalist for Best of Show. Also of considerable sonic note, Crystal Cable showed its adorable-looking, comma-shaped, 10,000€ two-way monitor, the Minissimo, driven this year by Crystal’s equally adorable, 10,000€ Cube integrated amplifier (essentially a pared-down SAGA system, using the same architecture and Light Drive transistor-biasing), fed by an Astell&Kern AK240 “server,” and hooked up with Crystal Cable cable and interconnect. 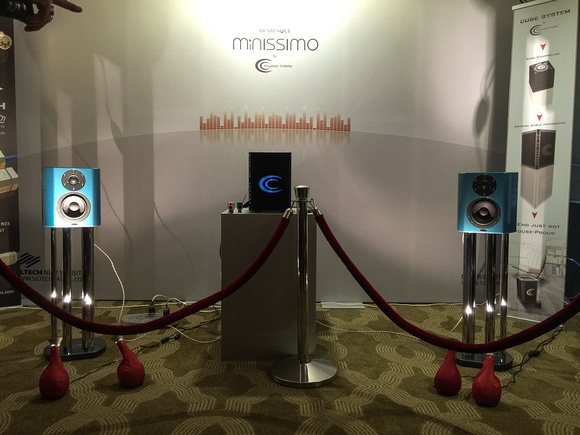 Though it didn’t do low bass, that was all the Minissimo/Cube system didn’t do—sparkling treble, excellent detail, lifelike transient speed, and a very natural midrange were all there in spades, hearts, and diamonds. Just add a subwoofer (if you must), and you’ll have one helluva stylish and great-sounding system. Wilson Audio showed a mockup of its latest (yet to be priced, though probably in the $500k+ range) WAMM (Wilson Audio Modular Monitor) loudspeaker. Not quite ready to launch at CES, the newest WAMM has been in the works for better than two years. A modular loudspeaker (as its acronymic name indicates) comprising a system of separate and separately adjustable drivers and enclosures, the WAMM was among the first transducers to offer adjustability in the time domain. By means of a patented system of rods, the WAMM’s modules could be ideally situated vis-à-vis each other and the listening seat in order to achieve a time-and-phase coherent wavelaunch. Originally introduced at John Garland Audio in 1981, the first WAMM was so successful that, after its debut, David Wilson quit his day job and devoted himself full-time to loudspeaker development and manufacture. During the 80s and 90s the WAMM was Wilson’s flagship (the last WAMM, the 7A, was introduced in 1997). Incorporating all the advances in technology that Wilson Audio has developed in the nearly twenty years since the 7A was released, the forthcoming WAMM will once again take its place at the top of the Wilson Audio line. The $79,750, three-driver, two-and-a-halfway Zellaton Stage floorstander, the latest offering from the 82-year-old German speaker company that invented the sandwich driver, made its debut at CES, driven by $94,750 CH Precision M1 solid-state monoblocks (also a debut) and the $32,975 CH Precision L1 preamp, and sourced by the $41,900 CH Precision C1 DAC, a $12, 475 Thoress phonostage, and a Sperling L-3 turntable with Sperling tonearn. 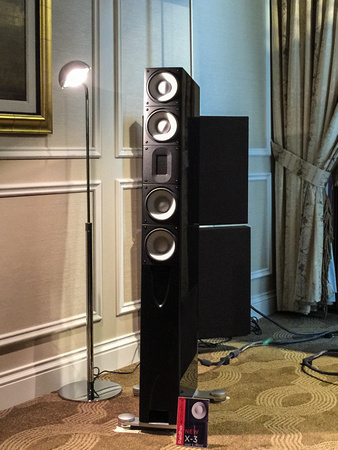 The Stage offered a fair measure of the natural timbre, speed, and resolution of the much larger and more expensive Zellaton Reference that so wowed me at Munich High End in 2014, though it wasn’t quite as breathtakingly realistic as its much larger and more expensive cousin. “Top down” in balance, the Stage was a little brighter and more forward on Leonard Cohen’s voice than what I’m used to hearing, and brighter on those angelic backup vocalists, too. Indeed, soundstage depth was reduced, perhaps because the speakers were virtually parked against the back wall of the smallish Venetian hotel room. Rockport introduced its $62.5k Cyngus three-way floorstander, featuring a better implementation of its beryllium tweeter, thanks to a new milled-aluminum waveguide. Driven by D’Agostino Momentum electronics, the Cygnus didn’t seem to have the deep, rich mid-to-upper bass that Andy Payor’s speakers are famous for, making the overall sound a bit leaner than what I'm used to from Rockport. On both Rachmaninoff’s Symphonic Dances and his Variations on a Theme of Paganini, the sound was “top down”—not bright, but not naturally full in the power range, either. Powered by Soulution 701 monoblocks and 725 linestage preamp, Magico’s stalwart, four-way, five-driver, aluminum-bodied Q7 was being shown with the new Q Sub 18 (two 18** woofers in a 570-pound, sealed aluminum enclosure), crossed over (low-pass-only) via the sub’s built-in DSP crossover and powered by its built-in amp. The combo was fast, powerful, and room-shudderingly extended on hard-driving jazz, and also showed excellent speed, color, and low-level resolution of texture and articulation on the smaller-scale Kodaly Duo for Violin and Cello. Having said this, I still thought Magico’s beryllium tweeter was too bright, adding edginess, forwardness, and sibilance to male and female vocals on Leonard Cohen’s “Ain’t No Cure For Love,” while also bleaching out some of the richly saturated color of Javier Mas’ accompanying acoustic guitar and Dino Soldo’s sax. On top of this, the chucking bass line of the Cohen song wasn’t as chewy or as well defined as I’m used to hearing. On a revisit to the Magico room, adjustments to the subwoofer improved overall balance, blend, and bass definition, reducing much of the brightness and edginess I heard on the first go-round. Vandersteen Audio introduced its six-carbon-fiber-driver $62k Model Seven MK II floorstander, with “improved midrange/tweeter integration and [an] improved subwoofer driver.” Powered by ARC electronics ($13k 5SE preamp, $30k Reference Phono 10 phonostage) and Richard Vandersteen’s own $52k M-7 HPA monoblock amplifiers, the new speaker did, indeed, have a richer sound than what I'd grown used to with the original Model 7, with tight, well-defined bass and the usual terrific Vandersteen midrange. The treble stuck out a bit, however, making Leonard Cohen’s voice on “Ain't No Cure For Love” sound forward and sibilant, and the soundstage a bit shallow. It may well have been the room, but I thought the Model Seven MK II was a little too bright on everything that was played. Raidho, those ingenious guys from Denmark, introduced the $30k X-3 augmented two-and-a-halfway floorstander, driven by Raidho’s own gorgeous new $30k Aavik U-300 300Wpc Class D integrated amplifier (complete with DAC and phonostage!). Though the sound was a bit phasey where I was sitting, the X-3/Aavik had the typical very full Raidho tonal balance and typical sensational Raidho transient response, resolution, and delicacy of texture. Though there was just a bit of room boom on the bottom with plucked standup bass, bass fiddle played arco had a gorgeous (and very realistic) purr. The Raidho duo was also very rich on piano, drumkit, electric bass, and Hammond organ, though certain treble notes seem a bit brightish. The speakers and amp generated a tremendous cushion of air behind central vocalists, with sensational transient response on guitar. So…who knows? The X-3s could be great, or they could have too much bottom and top end. Only time will tell, although I certainly thought their initial showing was promising. Though the MBL 101 E Mk II aren’t new, the MBL Class D Noble line of electronics being used to drive them were. I listened a long time in this room to a wide variety of music: “Guantanamera” from The Weavers At Carnegie Hall (quite lovely in timbre on voices and guitar, with far better central focus than the original 101 E and very good reproduction of the hard to reproduce standup bass); Marc Cohn’s “Ghost Train” (ditto); Michael Jackson’s “Black and White” (rock-solid power range); Ozzy Ozbourne’s “Crazy Train” (talk about a wall of sound! ); etc. While the presentation may not have been as hard-hitting or as wide-ranging and horripilating in dynamic contrasts as the Raidho D-5s driven by Soulution, or as minutely detailed as the sound in certain other rooms (the Noble line, good as it is, doesn't have the resolution of the Reference line electronics), the 101 E Mk IIs driven by Noble electronics were sure as hell more pure fun to listen to than any other exhibit at CES. Gauder Akustic’s strikingly attractive, six-driver, four-way Berlina RC 9 showed well, driven by Air Tight’s ATM 3011 220W monoblocks and its ATE 2001 preamp, sourced by a Transrotor Tourbillion Black ’table. On “Ain't No Cure For Love,” the sound was quite reminiscent of what I get at home with Raidho and Soulution—a big, beautiful, rich presentation that gave me goosebumps on voice and on those horripilating Hammond organ notes. Musical Surroundings showed Magico’s S 5 with Aesthetix electronics, and the sound was quite good, with deep tone color on piano and voice, excellent upper bass, and lightning speed on drum strokes and pizzicatos. The speaker sounded particularly well controlled on cymbals, and absolutely killer on snare and toms, despite a bit of room-boom in the midbass that tended to make kick drum and the bottom octaves of full orchestra a bit muddy. Lansche Audio of Germany showed its $36k, two-and-a-halfway 3.1 floorstander, with the company’s famous plasma tweeter paired to an ultra-light cone midrange and a downward-firing woofer in a reflex enclosure. Driven by Ypsilon’s $24.8k, 110Wpc Phaethon integrated (which debuted in Vegas), the 3.1 was nimble, warm and very well integrated—simply lovely on cello from Bach’s G Major Suite, with gorgeous timbre, very good transients, and remarkable air. Also from Germany and also equipped with a plasma-like tweeter, the $56k Acapella Audio Arts Cellini three-way, with hyper-spherical-horn-loaded midrange and spherical-horn-loaded ion tweeter, and an internal woofer driven by Acapella’s own electronics (everything else in the system was driven by Acapella’s hybrid/tube LaMusika integrated amplifier and electronics from Audio Note UK), sounded bright and clear, with excellent detail on violin and flute, very nice timbre on female voice and acoustic guitar, but a bit of room-induced boom on standup bass. Though focus was not as uncannily natural as it was on, oh, the Diasoul i, it was pretty damn good for a horn system, neither gigantic nor smeared. The Cellini was particularly realistic, as horn speakers tend to be, on, well, horns, trumpet, and trombones. Though the main attraction wasn’t the speakers or the electronics, Synergistic Research showed Magico S-3s with McIntosh electronics, mainly to demonstrate the magical effect of its new Atmosphere tuning-module room treatment. Another amazing tweak from the fertile imagination of Ted Denney, the Atmosphere is said to create “a natural RF environment” (whatever the hell that means). I’ll say this: Tuning the Atmosphere certainly changed the soundstaging, imgaing, timbre, and bass definition of the S-3s. And I’ll say this as well: I’ve learned through experience not to dismiss anything that Denney comes up with, no matter how inexplicable. Here’s yet another instance. 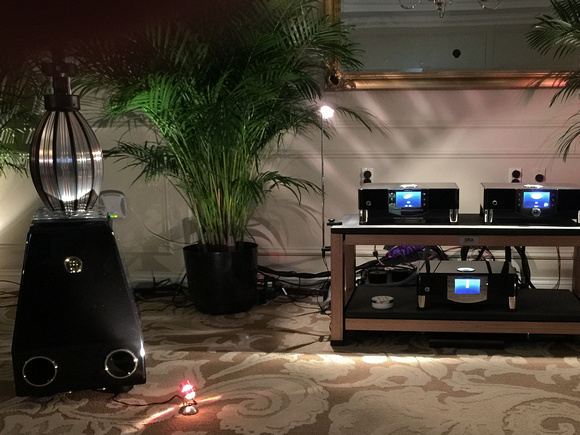 Stenheim showed its $225k, seven-driver, three-way Reference D’Appolito floorstander (with super-tweeter operating from 30kHz to 100kHz), driven by the $108k Qualia Japan MOSFET solid-state Indigo and $78k Dogma monoblock MOSFET amplifiers and a $68k Indigo Series preamp in two chassis. The big, handsome, aluminum-enclosed Stenheims showed better than well, especially when their center sections (which house the midranges and tweet and are motorized to adapt to room conditions) were canted inward, so the drivers were aimed more directly at the listening seat. Constellation made a very lovely presentation, pairing its Inspiration 1.0 Series electronics with $30.9k Wilson Sasha II loudspeakers. Though the speakers aren’t the last word in low bass, the sound was so delicately detailed and timbre so beautiful in color from the upper midbass up, that all was easily forgiven (at least, by me). VTL was also showing its electronics—the $33.5k S-400 Series II Reference stereo amp, the $15k TL6.5 Series II Signature linestage, the $12k TP6.5 Signature phonostage (with MC step-up)—with $30.9k Wilson Sasha IIs, using a Spiral Groove analog and dCS digital sources. The sound was very good everywhere but the deep bass, which is simply missing with the Sashas. Though the VTL gear didn’t have the quickest transients I've heard, it was wonderfully realistic on voice. Luke and Bea Manley’s gear has a sound that is unlike that of any other tube equipment—warm but not overcooked, detailed but not at all analytical, present but not overly projected, big but not outsized, powerful but with surprisingly good grip, with some extra dollop of magic in the midrange that makes everything that plays in or near there sound real. 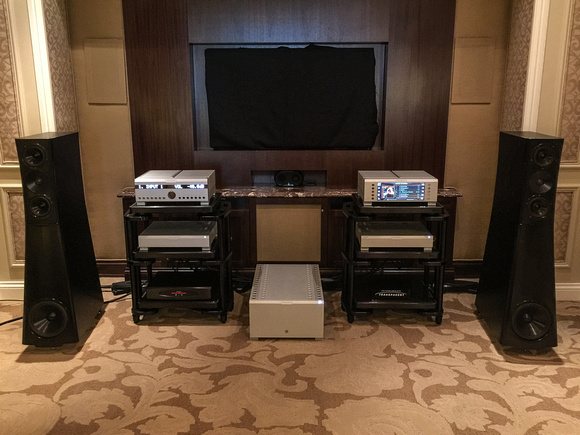 Finally, Dynaudio’s $85k Evidence Platinums were being driven by VAC’s $120k Statement 450 IQ monoblocks, $75k Statement Line Stage, and $80k Statement Phono Preamplifier, with a Brinkmann turntable as source. VAC’s electronics remain among the most transparent and certainly fastest and loveliest tube gear on the market, even though they couldn’t completely compensate for the somewhat leanish power range of the Dynaudio speakers. Still and all, the combo produced superb soundstaging and better tone color (meaning fuller power-range timbre) at louder levels, with exciting pizzicatos on the violins, excellent differentiation of similarly pitched instruments in the densely orchestrated fortissimos, and good if not richly colored low bass in the Feria of Ravel’s Rapsodie espagnol. Best Sound of Show (price no object): Tie: All five of my top contenders—the Focal Grande Utopia EMs driven by Naim Statement electronics, the Verity Lohengrin IISes driven by Lamm’s single-ended-triode electronics, the Wilson Alexias driven by Lamm’s M1.2 hybrid solid-state electronics, the YG Acoustics Carmel II driven by D’Agostino Momentum electronics, and the YG Acoustics Sonja 1.2 driven by Boulder electronics—were more or less on the same level of excellence. To this group I would also add the Estelon XA driven by Jadis, the MartinLogan Neolith driven by Krell, the Diasoul i driven by Zanden, and the Wilson Alexias driven by Soulution. If forced to choose one, I suppose I’d go with the Sonja 1.2s and Boulder, simply because I so enjoyed listening to the Bartók Second Quartet in that room. Best Sound of Show (affordable): The $1395 Magnepan .7s with Maggie’s $550 DWM dipole woofer module, driven by affordable Conrad-Johnson electronics, was hard to beat for the dough. Technological Breakthrough: The ultra-high-tech Diasoul i with boron-carbide tweeters and NCV midranges and woofers is a slam-dunk for this category, although the wonderful-sounding, omnidirectional-electrostat Muraudio Domain PX1 comes in a close second. Most Significant Trend: That I survived yet another CES. Most Coveted Product: Diasoul i loudspeaker.